ABC News previously reported Rosenstein would leave in mid-March. The deputy Attorney General is staying on longer than he was originally expected, sources tell ABC News. Previously, ABC News reported Rod Rosenstein was planning to leave the Department of Justice in mid-March. Sources had said, that he had wanted to stay on to ensure a smooth transition for his successor and wanted to accommodate the needs of new Attorney General William Barr. (Manuel Balce Ceneta/AP) Deputy Attorney General Rod Rosenstein speaks during a news conference at the Department of Justice in Washington, Dec. 20, 2018. One outstanding investigation is special counsel Robert Mueller's probe into Russian meddling in the 2016 election. Rosenstein oversaw Mueller's probe for more than a year, after former Attorney General Jeff Sessions had recused himself from the matter over his role in President Donald Trump's campaign. At the time, sources said Rosenstein had wanted to serve about two years and that there was no indication that he was being forced out by the president. 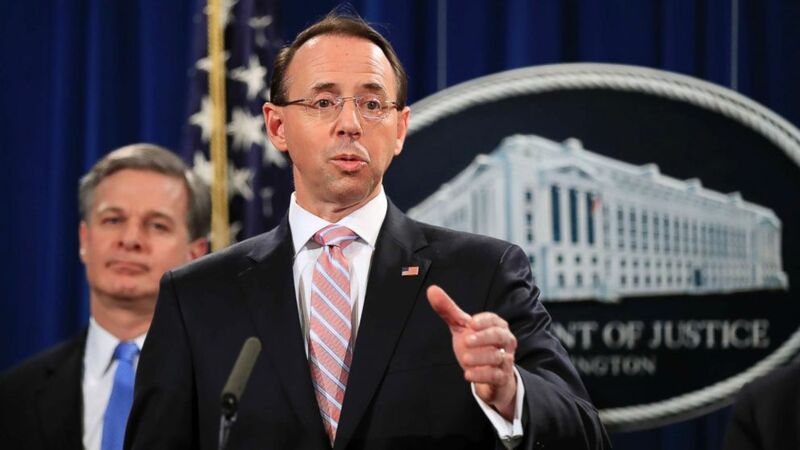 Rosenstein had became a frequent target of Trump's on Twitter, with the president re-posting an image of Rosenstein and others behind bars late last year. In February, the White House named Jeff Rosen, currently the deputy secretary at the Department of Transportation, as Rosenstein's successor.